Whether the marketing department at Chip Yates’ Flight of the Century enterprise chose an eponymous 235-horsepower Piper “Charger” to carry the inflight recharging batteries for upcoming tests, the name reflects Yates’ own driven personality. 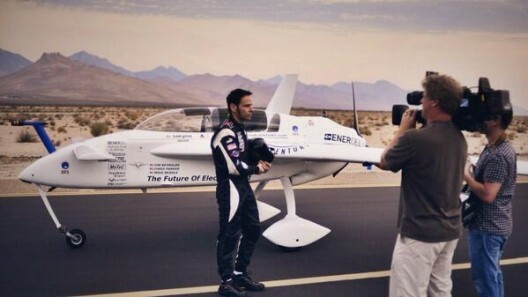 He’s set a world’s record for the Pikes Peak International Hill Climb, soaring uphill on a UQM-powered motorcycle, used the same bike to set Bonneville Salt Flats records, then pulled the bike’s motor, popped it into a Long-Eze, and proceeded to set speed and time-to-climb records. He’s announced plans to cross the Atlantic Ocean, duplicating Lindbergh’s flight with an electric airplane and the added and unprecedented technology of mid-air recharging. This will require extensive testing of the battery pack, tethering, docking and shuttling technology and the attendant software development. The Long-ESA (Electric Speed Altitude) Yates has flown to his records serves double duty as the Silent Arrow, an unmanned hybrid aerial vehicle (UAV) development for the Navy, which has made its China Lake test facilities available to Yates and his team. At some point this will require docking the Piper with the Long ESA, successfully recharging the canard’s battery pack and safely separating the two aircraft. As his record setting and lofty goals have come to the public’s attention, he’s also taken on a sub-career of public speaking, doing a TedX talk last December in Bermuda, a presentation to an economics forum, and several presentations urging young people to study science, technology, engineering and math (STEM). He’s cheered small children in hospitals, and even encouraged small desert towns to tackle big problems with the same innovative spirit he’s brought to his projects. As The News Review of Ridgecrest, California reported, “Yates underscored that striving is a critical part of innovation — that acute time and resource constraints are what fuel technological evolution. He said that despite Boeing’s multibillion-dollar budget and tens of thousands of employees, when it comes to defeating impossible odds, he would bet on his three volunteers with zero funding. “Likewise, Los Angeles’ many-orders-of-magnitude-greater budget and population cannot compete with the passion and hard work of a tiny, isolated community united behind a cause. “He encouraged the residents of the Indian Wells Valley to identify what makes us unique and join forces to promote that to the outside world. (He noted that communities with just as few resources have demonstrated how to successfully forge that path). Yates’ car is definitely not parked, but in a determined state of extreme forward motion.